When it comes to tidying the house, we mainly focus on the things we can see. Unfortunately, we don’t always think about what lies beneath that, including our air ducts. While the air ducts give way for cold air in the summer and heating in the winter to enter the home, over time they collect debris, dust, bacteria, and allergens, and over the course of the year, these can build up and even blow their way into the home. That’s why having your air ducts cleaned is essential to your Platte County home’s air quality. Your HVAC unit generates fresh or heated air that travels through the air ducts and then into your home, making sure you’re comfortable. While there’s often a filter in place, it doesn’t trap all of the dust and debris. If there’s a build-up, your HVAC unit will need to work harder, using more energy, costing you more money. You may dust and even vacuum the top of the air duct, but this is not sufficient enough to get within the system. It’s why this is a good idea to have your air ducts regularly cleaned by a professional duct cleaning service who know what to look for, and the proper methods involved in making sure the quality of air isn’t compromised coming into your home. Friendly Cleaning Services provides professional duct cleaning by trained technicians who will inspect and clean your air ducts and whole air system. 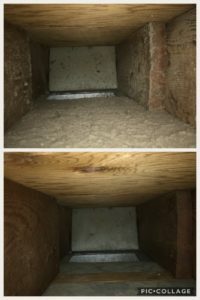 Our Platte County duct cleaning services include cleaning, sanitizing and sealing your entire system involving the vents, returns, trunk lines, access panels and blower motor, making sure that the entirety of your system is free of any harsh debris, allergens and bacteria and will also help maximize the efficiency of your unit, saving you in the long run. This also includes a courtesy filter inspection. According to the American Lung Association, “Indoor Air Pollution is wide spread. You are more likely to get sick from pollution in your home and office than from pollution in the air outside.” Your home’s air is 5 to 100 times more polluted than outdoor air. Allergies and sinus conditions are commonly caused by mold in the duct work, bacteria, viruses, fungi and dust mites in your home’s air. Every one of our team members is vetted and experienced in air duct cleaning. We’ll ensure the right methods are in place to ensure you receive nothing but a professional service. We start by arranging a convenient time for you for our cleaning technicians (identifiable by uniform and vehicle) to arrive and first discuss the air duct cleaning you require. We’ll let you know step-by-step what we’ll be doing. Our company will then get to work, first by locating air vents, sealing the return ones, and preparing the surrounding surfaces with rags to protect it from dust that may come loose. Our technicians will then connect an industrial strength vacuum to the main trunk line to collect all of the nasty things found deep in the vents. Then, select tools and compressed air are used to loosen up any more dirt and debris from the walls and hard to reach corners. It’ll make it easier for the vacuum to pick up and get rid of it. The whole process should take anywhere from two to four hours in a single-family home. This process may be longer, if you have a bigger family or pets. The whole process is super useful, and will no doubt be helping your HVAC unit not have to work so hard and leave better air quality in the home. Before our technicians leave, they make sure they put away all equipment, take their rags and clean the areas. We’ll also go over again on what we did and give tips on how to keep the air quality in your home the best it can be. Think your air ducts could use a good clean? Concerned about the air quality in your home? Give Friendly Cleaning Service a call today at (816) 590-6433 for the best air duct cleaning Platte County has to offer!